The Invacare® Pronto® M41™ Power Wheelchair with Office Style Seat features a compact mid-wheel design with cutting edge technology including high efficiency inline motors, simplified SureStep™, and a dynamic easy to use controller. The Invacare® Pronto® M41™ Power Wheelchair is made to order and therefore non-returnable. If you have any questions about the Pronto® M41™ wheelchair, please call us at 1-800-983-3602 and we'll be happy to assist you. 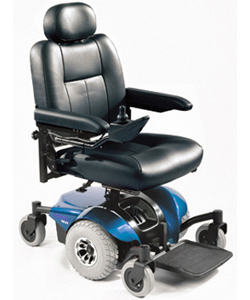 The Invacare® Pronto® M41™ Power Wheelchair with Office Style Seat ships manufacturer direct for free to the lower 48 States. If you are in Alaska or Hawaii, please contact us during business hours so we give you a price for shipping. The delivery method is curbside delivery meaning the driver will not bring the wheelchair inside so it is important to have help available on the delivery day. This wheelchair also requires minimal assembly and comfort adjustments will have to be made once assembled (such as the foot board height, armrest height, etc.). The batteries will also have to be charged prior to use. The design of this wheelchair puts the drive wheels in the middle of the chassis with 2 caster wheels in the front and 2 in the rear which helps to keep the center of gravity in the middle providing more stability. In addition, the motors are mounted transversely allowing for a more compact design so you can maneuver in tight spaces. The levers to put the both motors in neutral (free wheel) are conveniently located side by side under the front of the seat so the chair can easily be pushed if need be. The Pronto® M41™ power wheelchair features a simplified version of Invacare’s SureStep™ which allows the wheelchair to traverse over obstacles such as a door threshold up to 1” in height while remaining stable. The drive wheels of the Pronto® M41™ are make by Primo and feature a foam filled Primo Durotrap tire for flat free performance. 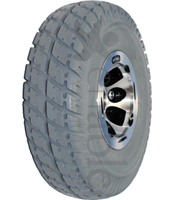 The tread pattern is designed for comfort and provides traction when you need it. The front and rear casters have a ribbed tread and are also flat free. The armrest pads are made from latex free solid urethane cast over a metal base. There is a gentle curve at the end for additional comfort. Urethane is easy to clean and very durable. The included seat belt features strong nylon webbing and has an auto style push button for easy use. It is also length adjustable. EnableYourLife.com carries the drive wheels, tires, caster wheel assemblies, and armrest pads in stock to keep your Pronto® M41™ Power Wheelchair in top shape! Overall width without joystick is 24"
Overall height is 41 1/2"
5 year warranty on base frame, 3 years on seat frame, 1 year on motors, gearboxes, and electronics, 6 months on batteries. Normal tire wear and upholstery wear (seat, back, armrests) excluded. All warranties are for parts only and exclude labor and shipping charges.